After 5 days of sickness today i am feeling good, able to cook and do all other works. Only for Blog sake , i made a curry from Schmetterling words. Yes, my H had cooked for us the previous night and told me to take complete rest. But i couldn't keep idle and also today was Blog Hop Wednesday and i have to post a recipe from my paired blogger's space. For today's event i cooked Broccoli Coriander Curry from Schmetterling words but my scheduled pair was Princy. Because of my carelessness i didn't notice it properly and in a hurry i made it from her space. So Sorry Radhika will sure try to post a recipe from Princy's blog within this week. Schmetterling words, very beautiful space with amazing recipes and pictures. loved her blog style and writing. I tried her Broccoli Coriander Curry, instead broccoli i used potatoes and little peas. The entire curry was cooked in cilantro n cashew sauce, result was too good. I am going to serve this for dinner along with rotis. Now to the recipe.. Grind all the ingredients under the title "To Grind" using little water to a smooth paste and keep aside. Boil potatoes and cut int to wedges, heat 1/2 tsp of oil/Butter in a pan and fry the boiled potatoes till crisp and keep ready. Heat oil in a pan, add the tempering ingredients and wait till it splutter. Then add the ground paste and saute till the raw smell leaves. After that add about 1/2 cup of water and peas and bring to boil and add the crispy fried potatoes and enough salt and coconut milk. Stir well and cooker for another few minutes and turn off the stove. That's it, flavor rich and yummy Potato Cilantro Curry is ready to serve. 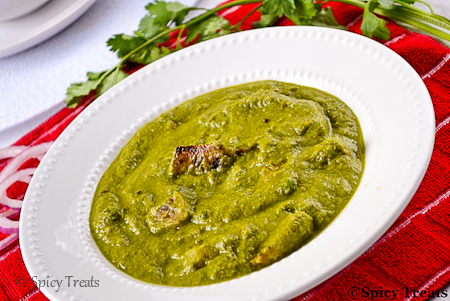 love the green in this curry! i heart coriander.. so this is a keeper for sure! Delicious looking curry. Excellent preparation. Potato in green curry looks delicious! Yummy treat!! This looks just right for my family! Bookmarked. Glad to know you feel much better Sangee..Curry looks super catchy and inviting,quite an interesting combo. Hope you are doing well now sangee. Did you visit the Doc? what did he say btw? The sauce looks very nice and greeny. Lovely pictures. The curry looks very rich. I can imagine how delicous it must have been with cashew nuts and potatoes, two of my favourite ingredients. lovely green curry,looks very nice...hope u r doing well now sangee.. I like anything with potato. Curry looks very appealing and looks like it goes well with roti. Wow, this dish too came out really well. Its taste and the green curry was different yet delicious. Thank you so much again. I have a belief that your recipes will never fail me :) thank you. I will publish your pictures on Spicy Treats' Facebook Page. Its not a compulsion just a request :) Thanks Again Nimi for all your lovely feedback. Yes, will do Sangeetha :) I did take a photo of this but somehow I lost it. Next time will try. Thank you!